I chose this poem today because it references Greek mythology -- a subject my friend Sherri and I spent a lot of time talking about together. This speech is quoted all the time in pop culture, but my favorite reference is from the movie Shakespeare in Love (by Tom Stoppard). Will and Henslowe are auditioning actors for Romeo and Juliet. According to the stage directions in the script, "a succession of would-be actors offer their version of Marlowe's lines, each as inappropriate as the other." They get through everybody without finding anyone with the slightest possibility of playing Romeo, and are about to leave when one more actor comes onstage and says, "I would like to do a speech by a writer who commands the heart of every player." Will, and the audience, expect him to launch into Faustus again, but instead, he (well actually she, but this is Shakespeare, so what do you expect?) feelingly recites several lines from Shakespeare's latest play: "What light is light, if Sylvia be not seen? What joy is joy if Sylvia be not by?" It's a great scene in a great movie (though you should be warned that it has some scenes that ought to be fast forwarded, or at least watched with a pillow in front of the screen). I was getting in tough with old friends recently, and finally reached my former roommate and landlord Emily. She told me that One of the other girls that lived with us is living in Fullerton, and that she could forward me her email address (which made me happy, since I had been searching for her too), and that our fourth roommate was "no longer with us." Evidently Sherri Frye Panhorst took her own life while eight months pregnant over a year ago. I don't know the details, but evidently she had stopped taking medications in order to get pregnant, and got overwhelmed. I was really worried about something like that happening to me when I went off my medications before getting pregnant with Elizabeth. I seem to be doing all right (except for some sometimes acute situational anxiety and depression this summer), but every time I hear that a friend has taken her own life, I wonder if that'll be me someday. I hope not. I know I have a lot of other options before it comes to that...but one of the symptoms of this disease is that you really aren't thinking clearly about rational options when you're in the throes of it. I kind of wish I had known about it at the time so I could have gone to the funeral, but at the same time, I'm kind of glad I didn't. I had just gotten pregnant again after my miscarriage, and I was trying to buy and move into a new home, so I was in a kind of fragile emotional state. I think that it really would have hit me hard at that time -- maybe even harder than Traci's death did this year. Well, enough about me. I thought it would be nice to write down some of my memories of Sherri, since I wasn't really keeping a journal at the time. Sherri, Elizabeth and I moved in with Emily right after she bought her condo in HB, and not long after that Pierside Ward split, and we were just barely over the line that put us in Seacliff (not that that matters -- I'm just putting things into context for my future self. Actually, most of this post is for my future self, so if you didn't know Sherri, you might not get much out of it. Sorry). Anyway, Sherri was a pretty, thin popular girl -- physically, she looked like the quintessential HB girl with bleached blonde hair, and fashionable clothes. Frankly, she intimidated me because she was all those things I thought I could never be. Over time, as I got to know her better, I found that she was a wonderful person, and we formed a great relationship. I think it's probably one of the best examples of a real symbiotic friendship I've ever had. I taught Sherri a lot of things from the academic point of view (we'll talk about that in a minute), but in return, she taught me a lot about the social and fashion stuff that I had somehow missed in my life. We went through my closet, and she told me which clothes I wasn't allowed to wear anymore, then took me shopping to find some key pieces in that year's fashions. She showed me how to look for clothes that I'd like, and that would flatter my figure, and not break the bank -- it was like being on one of those TV makeover shows. It was in the process of making over my life that she helped me start, that I decided to get back in touch with Peter, and we all know how that turned out. She also decided that in exchange for the hours I spent on the summer day camp she was trying to put together, she'd make lunch for me every day. This was deeply important to me because at the time, I was in one of my unable-to-eat phases. Sherri's lunches took a huge piece of stress out of my food day, and really improved my overall health, since I probably wouldn't have eaten at all on many of those days if she hadn't packed it for me. One of the earliest memories I have of Sherri was from even before we moved in together. We were carpooling with some other Ward members up to the LA Temple, and one of the guys was giving her a hard time about not knowing what some Mormon jargon meant. It was only then that I learned that she was a very recent convert who knew almost nothing about the church she had joined except that the Gospel was true, and Christ was the Savior. As roommates, with another, newer, convert in the mix, we had lots of discussions about gospel topics, and I did a lot of explaining of scriptural language, timelines, and even basic scripture stories. One funny memory was when I was telling her about Noah and decided that she might remember the story better if she heard Bill Cosby tell it. One of the things I had to remind myself of often while living with Sherri, and which bears repeating here since I can't give you a full picture of her, and it may seem lopsided, was that she was not dumb. She was a smart person, who loved to learn, but her life had taken a very different path than mine in our younger years, and she simply hadn't had a chance to learn things that I had been taught very young, and took for granted. Sherri was a private tutor for kids in Elementary School, and needed to find a way to get some income when school let out for the summer. The father of one of her students thought that it would be a good idea to develop a summer day camp based on the idea of Cultural Literacy. It would start out with a week about ancient Egypt and another on Greece, and then move on to science and astronomy, and that was just the first year. The possibilities for this thing were endless. The only problem was that Sherri was, by the definition of this book, culturally illiterate (remember that doesn't mean dumb, she had just missed learning about any of it). I started out defining some terms for her, and then telling her some of the stories from Greek mythology, and ended up spending several hours a week reading books and distilling the information into manageable bites for her, and finding and planning activities that would be age appropriate and educational. Sherri ate it up. She got fascinated by the subjects, and one of the things we had to do was continually remind her that there was no way she could cover everything there was to know about ancient Egypt in a single week, and that was OK. I lost track of Sherri when we both moved. I always imagined that she had gone on to make a great program for kids, and be a great friend to those she knew. I never really thought about her getting married, and I'm thrilled that she got the chance. I'm very sad that she didn't get the chance to hold her baby and watch him grow, as I'm watching Elizabeth -- it's one of the great joys of my life, and I know she would have loved it. Sherri was a good person, though. She was a faithful church member and I assume she and her baby are now together in heaven. I know a lot of people who look forward to getting to heaven because then they'll be able to learn the answers to all the unanswered questions they had in life. I like to imagine that Sherri is up there just soaking up all the knowledge God has to offer. You have done a beautifully sensitive job of sharing about Sherri. It's so sad that her life ended the way it did, and so young. I know that Heavenly Father loves each of us dearly, and knows what each of us goes through. He understands. Oh Karen. I am so very sorry. I remember so well all the conversations we had about Sherri and her helping you and you helping her. I remember how great you looked at David's wedding, as a result of her efforts. I am so proud of you. This must be a very hard time with all the insecurities of the job and housing market really slamming your family. 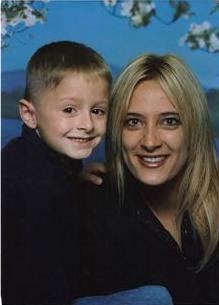 by the way, the picture is of Sherri and her nephew.